Fr. Dan Joyce, SJ says mass for the teaching fellows during their Fall Retreat. ACESJU Fellows become Catholic educators who integrate their personal, communal, professional, and spiritual lives. 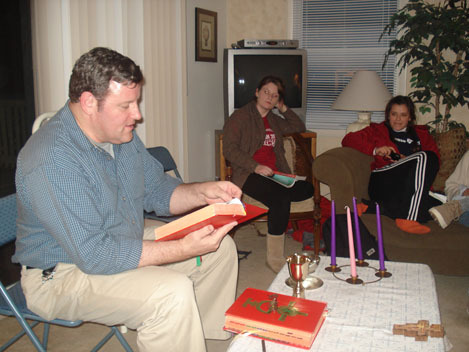 They are encouraged to develop individual spirituality, connecting their particular faith tradition to faith-based education and intentional community. Fellows participate in biannual retreats. Retreats allow the cohort to take intentional time to reflect, re-energize, and find renewed purpose in their work and mission as Catholic school teachers and administrators. Fellows also develop their spirituality through the Integrative Seminar, as they examine the intricate connections between education, community, spirituality and simple living. Fellows are encouraged to integrate spirituality into their community life and schools, and to use spirituality as a support to provide strength and nourishment.